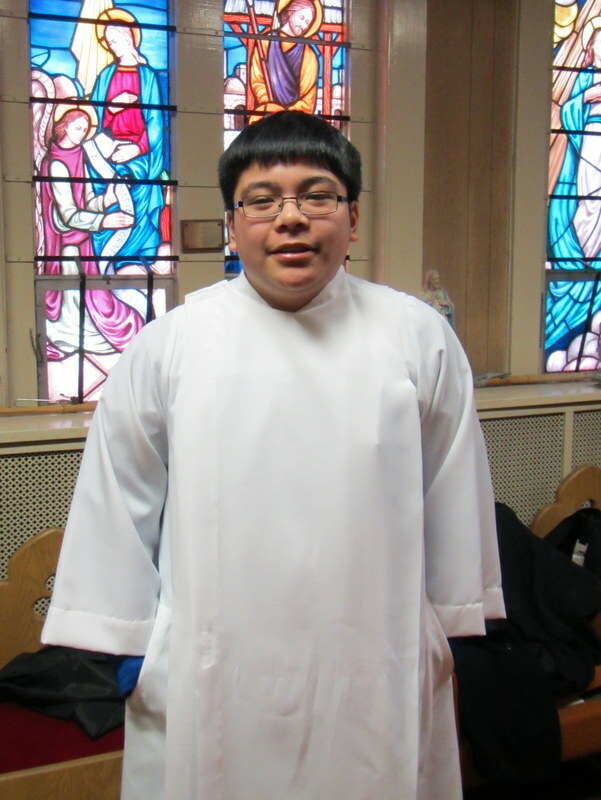 St. John Kanty Church - Buffalo, NY > News > News > CONGRATULATIONS TO RYAN DELA CRUZ, RECIPIENT OF THE BISHOP'S ALTAR SERVER AWARD! CONGRATULATIONS TO RYAN DELA CRUZ, RECIPIENT OF THE BISHOP'S ALTAR SERVER AWARD! Belated congratulations to Ryan Dela Cruz, who recently received The Bishop’s Altar Server Award. This Award was established to honor an altar server from each parish in the Buffalo Diocese for their dedication and service to their parish. The 2015 Awards Mass took place at St. Joseph’s Cathedral, 50 Franklin Street, Buffalo on Saturday, February 28, 2015 at 10:00 am with Bishop Richard J. Malone presenting a medal to each honoree. Following the Mass there was a reception at the Buffalo Niagara Convention Center, Franklin Street, Buffalo. Ryan serves at the 10:30 Sunday Mass.